Well, Rich, you've finally done it. I am crying like a baby. This post will forever be one I reread and enjoy. I am certainly thankful for you and your kindness, your lessons, and your special way with words. I needed this post today and I am reminded of something my grandmother once told me. Before she died she told me,"I will always be here if you need me." Rich, you were here for me today and I am most thankful. As long as they are tears of happiness, I'm good with that. I'm so very glad that this post found you when you needed it most. It's easy to write something when its true. Hey, my grandmother too. And you know what my dear, she still is, much like yours is today, tucked away in your heart, memories, and experiences. Seldom a day goes by that we aren't touched by them. Love doesn't fade. Great post, Rich. I particularly like your advice about getting involved in a solid project to ward of the blahs. And I've been following your blog for a bit (ever since you helpfully chimed in on the MyRagan debate going on at my blog) but never knew that you were a teacher. Thanks Rich for another great post. Too many times people never appreciate how things impact their lives. Now, I'm going to see what 10 things I'm thankful for. Thanks Mr Moustache, That was a surprise and very enjoyable. I like you too. (And I think you're possibly quite unique as the only totally non-recruiter in Recruiterville). I liked the Emerson quote a lot. Isn't that the fundamental issue of life, trying to move someone or oneself from the useless to the worthwhile. And it isn't always as easy as it was with your son. 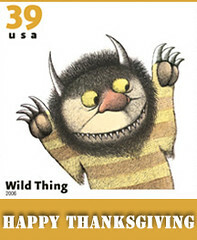 Best Wishes on American Thanksgiving. Ours is a minor holiday in October. Thanks Parker, that is great to hear; I continue to enjoy your blog too. Yes, I teach on the side. I mention it now and again, but I'm not big on title dropping. That stuff is better for Linkedin. Ha! Ichthus, It's amazing what you did with the idea on the CBS Message Boards. Very inspiring. Animal, It's easier (but not necessarily easy) after you learn how, but the path is as thin as a razor's edge. And yes, I kind of like being the non-recruiter in recruiterville ... much more interesting than my own industry on somedays. BCCS, Thanks. And Happy Thanksgiving again. Lovely message! And I especially liked your quote! !